Stay tuned. Monitor the weather forecast during hurricane season and particularly when impending storms are announced. The weather conditions can change quickly! I like to monitor the National Hurricane Center. They update the forecast at 8, 5 and 11 (am and pm) and as storms intensify and approach land they often add a 2am/pm update. This is the source that most other weather services use to create their reports. And we are certainly blessed on St Croix to have the NOAA Hurricane Hunters use our island as their Caribbean base… so when we see those super brave souls in their flight suits, we know there’s a storm brewing. WeatherUnderground.com is my favorite source for daily and extended weather forecasts, radar and they also have great storm maps that are easy to read. Stay in touch. When storms are about to hit the islands, WAPA (our Water and Power Authority) turns off power for safety purposes. So power outages are inevitable. Have a battery operated radio to get updates and keep you company during the storm – and be sure to pick up fresh batteries for it and your flashlights. Be sure to fully charge your cell phones, laptops and iPads prior to the start of the storm. While you’re at it, download a few movies onto your laptop or iPad to keep you occupied when the power goes out. Or like me enjoy your time “unplugged” and grab that book you’ve been dying to read. 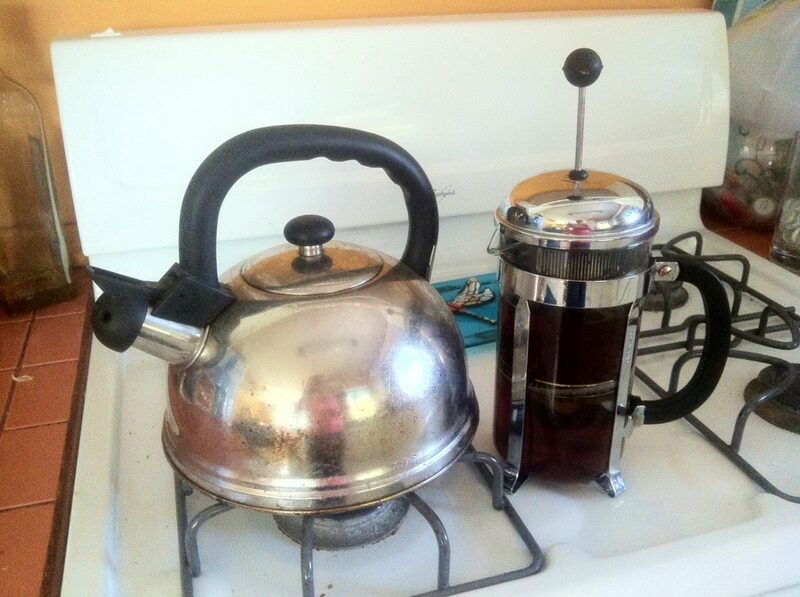 My tea kettle and French Press keep me happy. Unplug. As soon as the power goes out (or if there has been an announced time that the power will be turned off) I completely unplug all major appliances including my fans, TV and computer battery backup system. I leave one light on in my bathroom so that when the power finally comes back on, I’m aware. Of course, if you have a reliable generator to power your home, you may not need to take this step. But, I find it has saved a lot of my electronics from power surges. 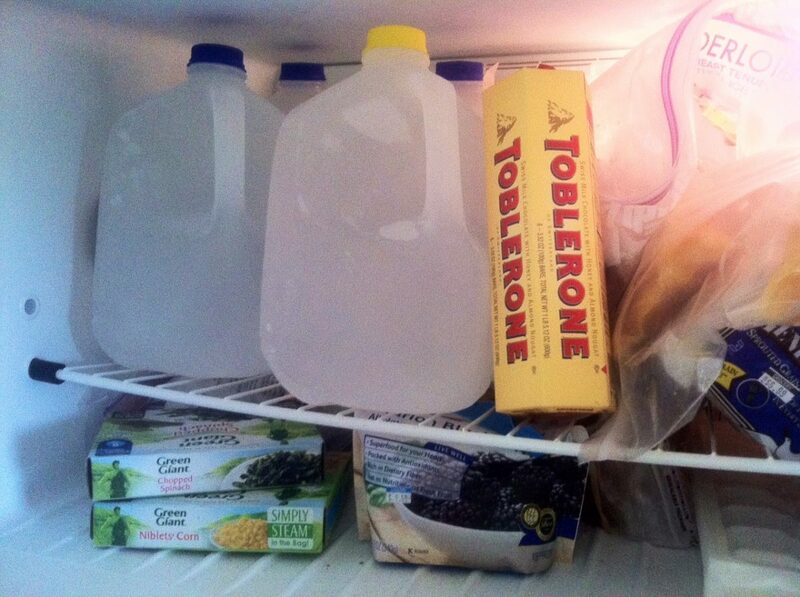 Keep your cool.I always pack my freezer with as many gallons of water as I can fit ahead of the storm. These freeze solid and help to keep my freezer cool longer when the power goes out. A couple hours after the power goes out, I put anything in the refrigerator that I need to keep cool (like mayonnaise or yogurt) in the freezer and use it as a super cooler. If I have a lot of food, I pack an actual cooler using one of the frozen water jugs. By keeping the freezer closed and putting things I want to eat in the cooler for easy access, I have a better chance of preventing spoilage over a few days. And when the ice melts, its still usable drinking water. Frozen water jugs keep essential food cold longer when the power goes out. it has worked wonders for my dog! Keep Calm and Drink Rum! Once you’ve got your property secured and your supplies in place sit back, relax and soothe your nerves with a nice cocktail. Gather your friends together in a safe place and have a hurricane party. That’s half the fun! Do you have a favorite Hurricane Preparedness tip you’d like to share? Post it below!